Just finished a play-through of rogue servitors in 2.2.3 and figured I share some thoughts for those who love this Civic. Before Le Guin 2.2, Rogue Servitors were unity-generating powerhouses. Their gameplay revolved around maintaining close to 30-40% of the population as bio-trophies to give your machines a crazy production output bonus, all the while getting great Unity. 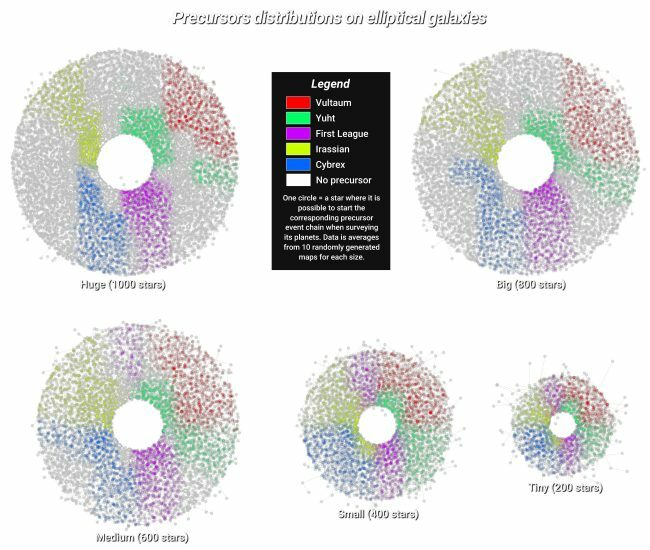 Usually around 5:30 or 11:30, if the galaxy were a clock. 2) You get the Waste Processing building as a random deal from the Racket Caravaneers. 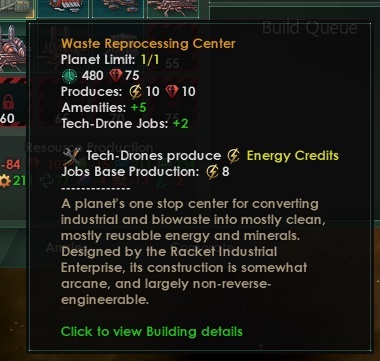 This building is almost mandatory for machine empires because they have an insane time trying to remain energy-positive at the start of the game. It gives a flat 10 to energy and minerals, gives +5 ammenities, and provide two tech jobs… incredible. Because of the Organic Paradise building. It provides +20 Housing, +20 Bio-trophy jobs, and +2 Maintenence Drone jobs. It is the strongest housing building in the game. The big epiphany to this building is that it counts as housing for BOTH drones and bio-trophies. In fact, most of my Organic Paradise buildings in my empire have zero bio-trophies in them. Having a building with so much housing lets you easily unlock all 16 building slots on a colony without investing in housing districts. This has a number of applications. First, you min/max machine worlds. Here is one of my machine worlds from my last playthrough. As you can see, I only needed one district to help me get all 16 slots. On smaller planets with less built-in housing from the energy/mining districts, you may need 2 or even 3. Second you can min/max habitats (or any other small colony planet) for super efficient play regarding Empire Sprawl. You can have 0-district planets or habitats that only contribute 2 to your empire sprawl, yet is filled with all 16 buildings doing every advanced function in the game.. including research, producing special resources, or even increasing your fleet capacity with fortresses. Oh yeah, you can also use them as they were intended, by housing bio-trophies for Unity generation. The bottom line is it doesn’t matter how small the colony is: you will always be able to unlock 16 building slots with zero housing district investment. Even on tiny habitats where the research districts do not provide any innate housing themselves. Will having a large bio-trophy population with the mandatory pampering living standard be a drain on my empire’s resources? No. For two reasons. The first is so OP, that it might get fixed before 2.2.3 becomes live. It is the fact that you don’t need to even feed your bio-trophy population. That’s right, zero food generation, and your bio-trophies will still grow and function. The “no food” debuff is -75% growth and a happiness hit. The growth debuff works in our favor because it helps us get a naturally good ratio of bio-trophies to drones. We don’t want them growing and filling up space in their Organic Paradises on the planets where they co-inhabit with drones. The happiness debuff is nothing as well… most of my bio-trophies seem to sit at 65% happiness. The other reason is that you don’t need many bio-trophies to cover all your unity generation needs. In my current playthrough, I have 1 bio-trophy per 12 drones roughly. I feed my enitre bio-trophy population via one artisan district on my First League Ecumenopolis with extra consumer goods to spare. This is enough unity for me to run four Unity Ambition edicts simultaneously (reserving the last Ascension slot). My research speed is so fast that I’ve research a +15 admin cap increase every 20-36 months. In most other games, Empire sprawl quickly outpaces admin cap (and that’s perfectly okay). In this playthrough, admin cap is outpacing my empire sprawl. It’s all I’m doing with my Society research because I don’t need to increase food production, or army strength. On top of my super efficient colonies. So I have 0% penalty to Unity and Technology cost, and my weapons damage/shield and admin cap repeatables keep growing. What Civics and Traits do I take? Machine races only need to focus on energy credits and minerals. I’ve found that Rockbreakers as a civic, and drills as a robotrait interact well. It reduces the amount of miners you need (so more drones can be put on energy generation). 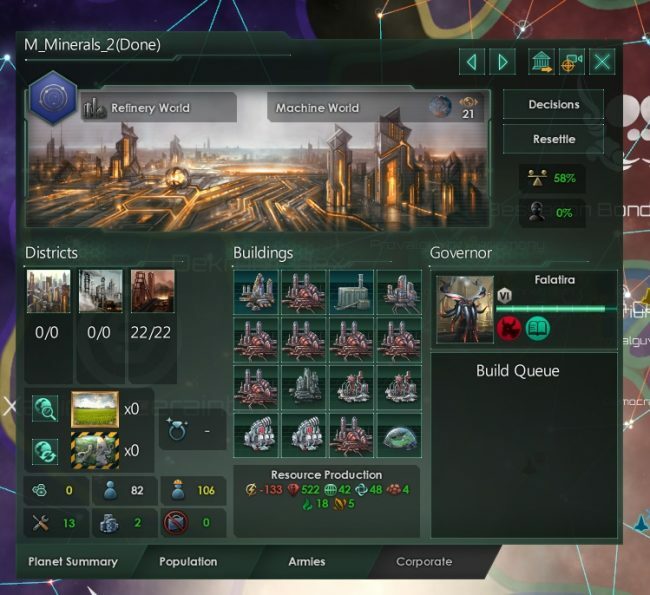 Minerals are used for everything, like building districts, and feeding your research and alloys. 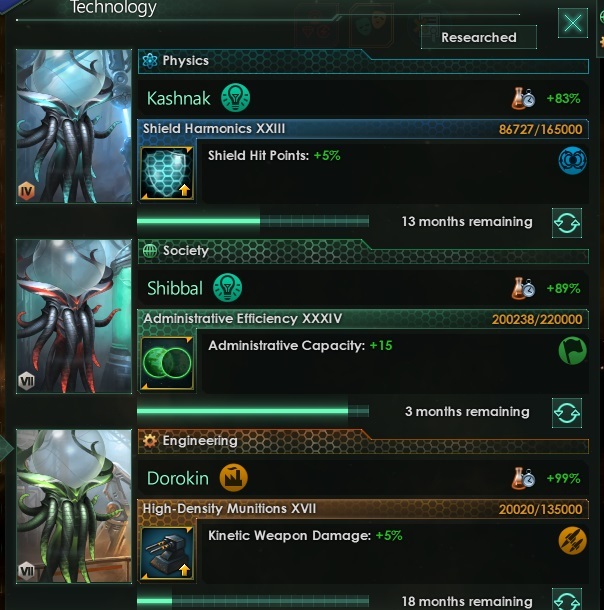 For negative robotraits, I took -% leader xp gain and +10% housing to start (plenty of housing from Organic Sanctuaries). As soon as you can, you want to get robomod points so you can mod-off the +10% housing and also pick up +15% energy generation. Much later on you can then pick up the research bonus as well with an Ascension Trait. As for the bio-trophy traits, get negative leader traits (they can never be leader), and get +unity generation and -consumer goods usage. My bio-trophies only live on my starting planet and habitats, so they don’t really need habitability in this version. What Tradition Trees / Ascension first? I always pick Expansion first because it is the strongest tree. The rest is your preference. I always never take the one that forms federation and instead reserve the last Ascension Perk so my Unity Ambitions costs will be lower. As for Ascension perks it really up to you, but my personal preference is +10% tech, +50 edict duration, voidborne, robomod points, master builders, galactic wonders, then machine worlds. I never really liked habitats before 2.2, and I only took voidborne to take away the random tech hunt with a voidcraft scientist to get mega-construction. But I hated wasting 2 extra Ascension points just to get galactic wonders. But with a machine race, you don’t have a regular ascension path (bio/psionic/synthetic), so you can afford to pick up voidborne and master builders. Plus, habitats are not bad at all in 2.2.3, especially with Organic Sanctuaries. How do I upgrade Organic Sanctuaries to Paradises? You no longer get it through traditions, but through technology. The technology is called Idylic Architecture, which is statecraft, and the only prerequisite is Weather Control Systems (City District Housing +1) which is an engineering trait. Here is a nifty tech tree. The hardest thing about a machine playthrough in general is getting energy positive at the start. You want to be on the look out for Caravan deals for the Waste Reprocessing Center. Build solar panels on all your starbases. Set market trade deals for any excess resources, especially consumer goods. Bulldoze your food districts and put those drones on energy generation with tech jobs. Settle star systems with good energy bodies and hold off on building orbital mining and research stations until your energy budget can handle it. Make sure your tech drone jobs are filled to max at all times and decrease priority of all other menial jobs until energy is positive.